Your home’s entry is generally a high useage area that needs to stand up to the test of time and traffic. 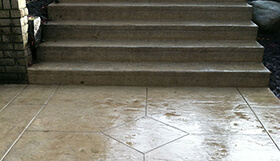 Therefore, concrete is a popular choice, for its durability and versatility. High quality concrete material provides durable and long-lasting entries. For example, we use over four inches of concrete in our entry installations to extend the life of your investment. Our knowledge of the proper colors, textures and scoring weaves a complimentary design that suits your taste and your home’s palette. We offer a variety of stamped and scored patterns as well as elegant textures and colors.